SKY MAP: Both triangles shown at 10:30 p.m. June 2 from mid-northern latitudes. We're less than three weeks away from the official start of summer in the Northern Hemisphere (8:30 a.m. EDT on June 21). And as darkness falls this week, the famous Summer Triangle can be found emerging into view low in the eastern sky. This huge, nearly isosceles triangle is composed of three of the brightest stars in the sky, each the brightest star in its own constellation. The brightest is the bluish-white star Vega (magnitude 0.0), in Lyra the Lyre. Next in brightness is yellow-white Altair (magnitude +0.8) in Aquila, the Eagle. Finally there is white Deneb (magnitude +1.3), in Cygnus, the Swan. The stars appear in that order, as the twilight sky grows dark. You might want to wait until two or three hours after sundown for this stellar trio to gain some altitude above the horizon [Map]. If you wait until dawn, the Triangle will have moved to a point almost directly overhead. The Summer Triangle is one of the favorite parts of the sky for most sky watchers, perhaps because of its sheer simplicity in contrast to overabundance of bright stars found in the wintertime sky. Moreover, since this area of the sky is far removed from the zodiac, where the bright planets roam, it does not have any strange "stars" temporarily altering its familiar pattern, as Mars did to Gemini during May. If you are just getting started in astronomy, and especially as you watch for the first stars to come out after sundown during the coming weeks, you are not very likely to confuse the Summer Triangle with anything else. But this year is an exception. In our current evening sky, there is a somewhat smaller and brighter triangle configuration, although it is only temporary since one of the three points on the triangle is marked not by a star, but a planet. 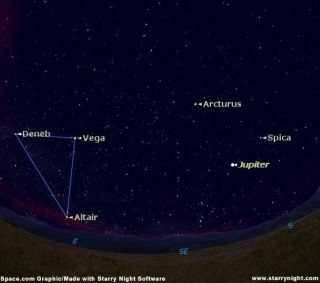 Facing due south this week at around 10-p.m. local daylight time, we can see an almost perfect isosceles triangle formed by the bright stars Arcturus and Spica and the brilliant planet Jupiter [Map]. Since Jupiiter is the brightest of the three points, I suggest we call it "Jupiter's Triangle." This Triangle appears to point almost straight up, with the brilliant yellow-orange star Arcturus (magnitude -0.1) at the vertex. The bluish star Spica (magnitude +1.0) and the planet Jupiter (magnitude -2.0) form the bottom of the Triangle. The Arcturus-Jupiter and Arcturus-Spica sides of the Triangle measure about 33 degrees in length, while the Jupiter-Spica side is about 17 degrees long. For a reference, keep in mind that your clenched fist held at arm's length measures roughly 10 degrees in width. This week, on the evening of June 7, a waxing gibbous Moon will be positioned between Jupiter and Spica; if you draw an imaginary line between the two of them, the Moon will lie just below this line (or below the bottom of the Triangle). But unlike the famous Summer Triangle, which is composed of fixed stars, Jupiter's Triangle will be in a constant state of flux in the coming weeks because Jupiter will be slowly shifting its position against the background stars. Since March 4, Jupiter has been undergoing a retrograde (backward) motion and has shifted westward against the star background. As a result, it has been approaching Spica and will continue to do so until its retrograde motion ends on July 6. By then the two will appear 15 degrees apart, but as Jupiter resumes its normal eastward motion, they will spend the rest of the summer gradually getting farther apart. Finally, during mid-to-late September, Spica will become too deeply immersed in the sunset glow to be seen. Jupiter itself will disappear into the sunset glow by late October. When they reappear in the morning sky later in the fall, Jupiter will have moved far to the east of Spica and will no longer make for a very convincing Triangle with Spica and Arcturus. So enjoy it now, while it lasts!